Welcome to Waterdown Physiotherapy's guide to Cast Care. Unless you have a waterproof cast, you should keep your cast dry. However, even waterproof casts should be dried out thoroughly after getting them wet. If you don't dry your cast out after getting it wet, the skin underneath stays damp and can become moldy and smelly. Also, don't swim with your cast on unless you have the waterproof kind. To keep your cast dry in the shower, you can enclose it in a plastic garbage bag. Tape the open end of the bag so that water can't get in. You can also buy a special cast protector. Casts don't completely harden for about two days. Be especially careful with your cast during this time. Don't rest the full weight of the cast on a hard surface during these first two days. 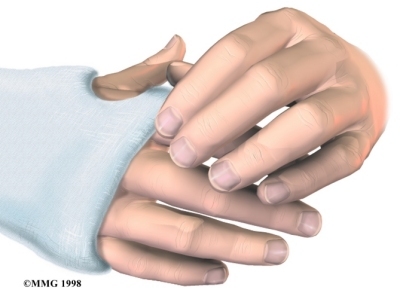 Doing so can dent the cast and can cause pressure sores on the skin under the cast. If the cast involves your foot, don't walk on it for forty-eight hours, even if you have what is known as a walking cast. Walking on a soft cast may cause it to crack or dent. Keep the casted or splinted limb elevated (propped up) above the level of your heart whenever you're able to do so. This will reduce the swelling and help to keep the cast from becoming too tight. Avoid too much activity and situations that may re-injure you or damage your cast. Remember your cast is there to help your arm or leg heal. It can't do its job without your cooperation. If you have any of the following warning signs after your cast is placed or changed, you should consult your doctor. Your injury will probably cause some pain, but if the pain becomes steadily worse after the cast has been placed or changed, that may be a sign that the cast is too tight. The area under the fingernails and toenails is called the nailbed. Normally the nailbeds are pink. When the nailbed is pinched and released, it turns white for a few seconds and then pink again. This is because small blood vessels under the nail are squeezed shut. When you release the pressure, the blood vessels quickly open back up, turning the nail bed pink once again. This is called blanching. If the nailbed has a blue color and doesn't turn pink again after being pinched and released, this may be a warning sign that the cast is too tight. You may feel some numbness after a broken bone has been straightened or fixed if any type of anesthesia (such as a regional block or local anesthesia) was used. This should wear off in a few hours. But if you feel constant numbness or tingling in the fingers or toes of the casted arm or leg, this may indicate that the cast is too tight or that a nerve has been injured. Because of your injury, you may have pain that makes it difficult for you to move your fingers or toes. 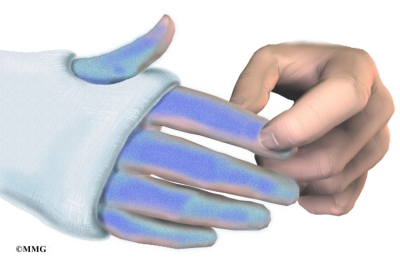 But if you have no ability to move the fingers or toes of the casted arm or leg, it may be a signal that the cast is too tight and the muscles or nerves aren't working properly. Many people notice a difference in the temperature of the casted arm or leg. Usually, this difference is minor. But if you have any other problems mentioned here that suggest that the circulation is not good, and the hand or foot is cool, it may be a sign that the cast is too tight. If you have severe swelling above or below your cast, try keeping the casted limb propped up above the level of your heart. Most injuries cause at least some swelling. But if the swelling continues to get worse after the cast is put on, it may be either a sign that the cast is too tight or that something is going on under the cast that needs to be checked. If your cast is dented or cracked, or starts falling apart before you are due for a checkup, this could lead to problems with healing. Small cracks are probably alright, but if the cast isn't doing what it is supposed to, it could affect the healing of the injury. You should also check with your doctor if you think the cast isn't holding the arm or leg still enough.